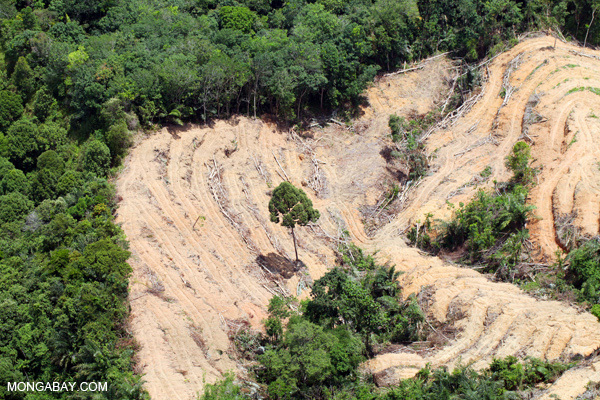 Destruction of rainforest in Malaysia for palm oil production. Photos by Rhett A. Butler. Cargill, one of the world’s largest agricultural companies, has extended its zero deforestation commitment for palm oil to all commodities it produces. The commitment, announced Tuesday at the United Nations Climate Summit in New York, is the most far-reaching zero deforestation policy ever established, covering Cargill’s sprawling global empire of businesses, including palm oil, sugar, soy, cattle, and cocoa. The commitment comes just days after Cargill announced it had signed a deal with The Forest Trust (TFT) to implement a “No Deforestation, No Peat, No Exploitation” for its palm oil supply chain. It also follows years of campaigning by Rainforest Action Network (RAN) around the ag giant’s palm oil sourcing practices. The activist group immediately welcomed the commitment. Cargill’s pledge was also welcome by Forest Heroes, a new campaign that has focused on the links between big agricultural companies and tropical deforestation. Cargill isn’t the first agribusiness giant to establish a zero deforestation sourcing policy across all of its supply chains — Singapore-based Wilmar made the same commitment last December. Since then, dozens of major commodity buyers have announced zero deforestation commitments, ratcheting up pressure on other producers. Now Hurowitz is calling for Bunge and ADM to do the same. Commercial agriculture is the largest direct driver of tropical deforestation. After cattle ranching — the world’s largest cause of forest loss — palm oil, soy and sugar cane production have had a major role in forest conversion. Logging also contributes by facilitating access to remote areas and increasing pressure to clear forests for agriculture. This article was originally written and published by Rhett A Butler, the head administrator for news.mongabay.com. For the original article and more information, please click HERE.